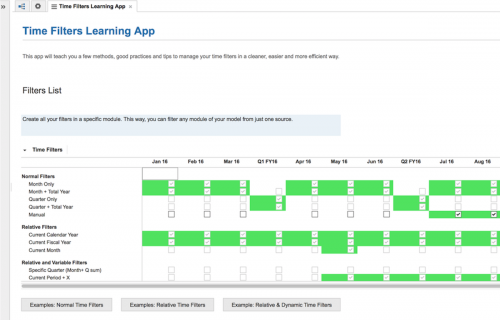 This Learning App teaches model builders the best way to easily apply time filters to modules in order to increase usage and performance of their models. 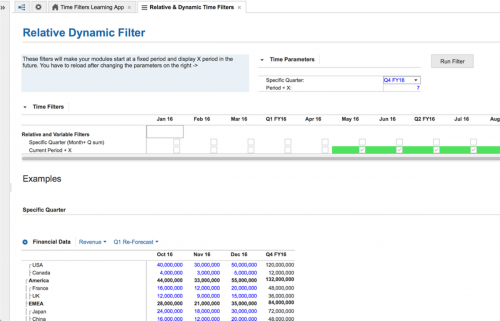 Explain how to use a centralized filter module to set your dashboards to show only month, quarter, total year, and/or combinations. Explain how to use filters to show only the current fiscal year, the previous one, the next, etc. Explain how to use filters to show only a specific selected quarter, month, X periods after, or around a date, etc.